The first thing you typically hear when learning how to choose the right clothing for backpacking is that layering is of the utmost importance. The example that’s often given is that instead of carrying one heavy coat you should carry multiple lighter items that can be combined to equal the warmth of the heavier coat. This “combination” is then touted as being superior because in addition to the maximum warmth it can provide, the individual components can be used in other combinations to provide varying levels of warmth when the maximum is not needed. I can vividly recall demonstrations in the Boy Scouts where somebody would throw the heavy jacket aside and then proceed with pulling a short sleeve t-shirt, long sleeve t-shirt, sweater, hoodie, fleece, long underwear, extra long underwear, and rain gear, from his pack. The problem with this example of layering is that, as a concept, it’s incomplete. One of the quickest ways to overload your pack (aside from buying tents, backpacks, and outerwear with the word “bomber” in the description) is to pack too many clothes. More specifically: too many layers. The missing piece to this puzzle is that by packing the right layers you don’t need to pack as many. So, what are the right layers, and how many do you need? Base layer: A thin, lightweight layer worn next to skin… preferably with a trim fit in cooler weather and a looser fit in warm weather. Active insulation: Worn over a base layer for additional warmth while hiking. Stop insulation: Worn over a base layer for additional warmth when in camp (or while stopped for extended periods of time). If you’re carrying a piece of clothing that doesn’t neatly fit into one of these categories, chances are you don’t need it. Notice that the middle two categories assume that you’re wearing them directly over your base layer with nothing else in between. If you find that what you’re using for either of these layers necessitates additional layers, you should rethink what you’re using for those layers and substitute for, not add to, them. In order to determine what you’ll actually want for each of these layers, let’s take a closer look at the functions each are intended to serve. There are other, more subtle, differences, like the fact that merino wool’s ability to absorb a little more moisture (which is why it takes longer to dry) can make it more comfortable to wear since it takes longer for that moisture to come back into direct contact with the skin. I think this ends up being largely subjective and greatly depends on the person and the brand. There are people who prefer the softer feel of some synthetics and others who prefer the “dryer” feel of merino wool. From left to right: Rab MeCo 120 long sleeve T, REI Midweight Polartec Power Dry Half Zip, SmartWool NTS Light 195 Zip-T, Rab MeCo 165 Hoodie. In my opinion, the weight/thickness of the fabric is actually more important than the type. A lighter weight wool shirt will dry faster than a heavier synthetic shirt, so the advantage of the synthetic shirt is offset in this case. Features like chest zippers and hoods can make a difference too, but in mild temps (40’s and above) my top 2 priorities are dry times and odor control. For that reason, I’d be more likely to pick a micro weight merino wool shirt over a comparable (or slightly heavier) synthetic shirt. Beyond those general priorities, I also need to take into account the environmental conditions I’m expecting to encounter. If we’re talking about temps mostly in the 40-60 degree range, I’ll want a long vs short sleeve shirt. I’m also more likely to stick with long sleeves in higher temps if the environment has high UV exposure and a large variation between day and night time temperatures (think western mountains in the spring/summer, e.g. the Rockies and High Sierra). If we’re talking about a hot and humid environment with a fair amount of tree cover (summer on the Appalachian Trail), a long sleeve shirt is going to be too warm… so short sleeves become more practical. In cooler temps, like 20s-30s, I’m still more likely to wear a lighter shirt vs a heavier one (not necessarily the micro weight shirt I’d wear in warmer temps, but still something in the “light weight” vs. “mid weight” category). The reason is that I know I’m going to sweat regardless of the temperature, and in cold conditions not only is it more important to have quicker dry times (which the lighter fabric will provide), but that process is further impaired by the fact that it’s cold. I think it’s better to err on the side of a lighter fabric because the combination of fit (trimmer will be warmer) and the “active” insulation layer will determine warmth, not a heavier base layer. What a heavier base layer will do is ensure that you stay damp for longer because it won’t dry as fast. 1) General Temperature Range – What are the average daytime temperatures you’re expecting to encounter? 60s and above, 40s-60s, 30s and below, etc. 2) Wind – Are you hiking in an area regularly exposed to high winds (ridges, alpine areas, etc.)? 3) Sunlight – There’s a big difference between a sunny 45 degrees and an overcast 45 degrees. Are we talking spring afternoons with passing clouds or gray winter days? For the most part, I have two pieces that I use for “active” insulation, depending on the conditions: a wind jacket and a lightly insulated vest. Why not a fleece? There is a two part answer to this question. The first part is that in my experience, a lightweight fleece works fine when the conditions are sunny and calm, but as soon as the wind picks up it cuts right through this layer. When that happens, it doesn’t matter how thick your fleece is… its ability to trap warmth between you and it is compromised. Say hello to convective heat loss. Additionally, if you’re wearing a pack, there’s a very good chance that your back is sweating, and a fleece will absorb that sweat and stay damp for a longer period of time. A wind jacket, on the other hand, should perform as advertised: it blocks the thing that results in heat loss. 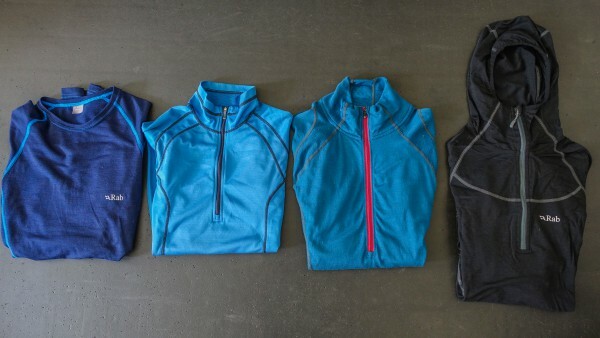 There are lots of options here; some are in the 6-8oz range and feature more of a softshell material, which breathes better but isn’t as effective at blocking the wind… plus they absorb more moisture, whether it be sweat or light precipitation. My choice for this application would be a lighter jacket with a less breathable construction; you may sweat more but the material won’t absorb any of it, which means it’ll dry almost instantly once you take it off. I prefer a wind jacket (basically a lightweight nylon shell without the waterproof/breathable membrane on the inside) in most conditions where the daytime temps are in the 40-70 degree range. The biggest selling points for the wind jacket, in these conditions, are the weight (1.6oz for the Montbell Tachyon) and its inability to absorb any moisture whatsoever. There are lots of options for Active insulation pieces. The decision to choose a fleece, insulated, or wind jacket could be dependent on your rain gear as well. In colder temps I use an insulated vest (Arc’Teryx Atom LT) that has synthetic insulation and a nylon face fabric that blocks the wind. What I like most about the Atom LT vest is that the side panels aren’t insulated; rather, they consist of a stretch mesh material that breathes much better than if the jacket was fully insulated. This means that any sweat in the underarm area won’t absorb into the insulation and is more likely to evaporate since it’s exposed to outside airflow. If the conditions become more extreme, I’ll add my rain shell. This leads me to my final point regarding “active” insulation: it can also be dependent on your choice of rain gear. If I decide to use UL rain gear in an environment known for cold rain (e.g. 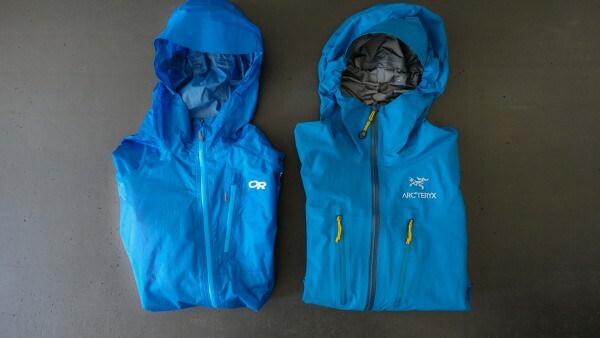 summer monsoons in the Rockies), a wind jacket may not integrate into my overall clothing system because I would probably want my “active” insulation layer to also act as a buffer between my base layer and rain shell, in addition to performing its primary function. For example, if I were to pack my OR Helium II rain jacket for a thru-hike of the Colorado Trail in July/August, I might be hesitant to rely only on a thin piece of nylon (my wind jacket) to act as that buffer. In this case I’m more likely to choose a lightweight fleece as my “active” layer; it won’t be the most effective insulation on its own, but it will give me a buffer against cold rain under the thin jacket. On the other hand, if I have a fully featured 3L rain jacket that can protect me against cold rain all on its own, I would likely ditch the fleece for a more effective “active” layer (i.e. the wind jacket). The advantage to the heavier rain jacket / lighter wind jacket combo is that each is better suited for its intended purpose. The downside is most likely cost, and the weight difference probably ends up being a wash.
There’s really no right or wrong way to approach this layer insofar as the type of jacket is concerned (fleece vs wind shell); the key is to understand how it’s going to work with your overall system as well as on its own. The products I mentioned above are just examples of what works for me. This is a much simpler layer to explain. Unless we’re talking about warm and calm conditions (evening temps above 60 degrees), this will always be a puffy jacket of some sort. Some will argue that down has no place in a damp environment, but unless you’re out in wet conditions for longer than a week or two with no ability to dry your jacket (precipitation plus high humidity), down will always be the superior insulation. Down vs synthetic will largely be a cost vs weight issue for most people since both will work. 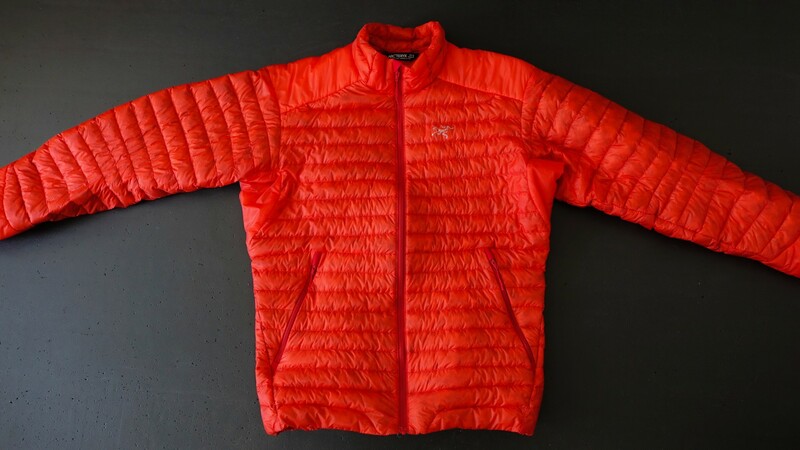 For most 3-season conditions where daytime temps are above 50 degrees and evening temps are in the mid-30s to 40s, a 6-9oz jacket is ideal, assuming it’s in your price range. There are some synthetic jackets that are cheaper and put you in the 10-12oz range, and that’s still perfectly acceptable. There’s no real reason to go over 12oz for this layer unless you’re looking at colder temps and adding a hood. Even then, there are still viable options in the 8-12oz range. Rain gear can be an exhausting proposition because the discussions surrounding it are equally exhausting. Enthusiasts will argue over this subject at a length that can only be described as epic. I’ll address some of these points in a future article because I don’t think the subtleties are necessary for this particular topic. The important point for this conversation is that some rain gear will offer better protection against the elements than others. The capacity of your rain gear to protect against cold rain, for example, may inform your decisions surrounding insulation layers as well. At a very high level, a heavier (3 layer) rain jacket will offer better protection against the cold than a lighter/thinner rain jacket. This variable may affect how you choose your “active” insulation layer. This isn’t to say that a lighter rain jacket is a bad choice; it’s just a variable you have to consider within the context of your overall system. It’s also important to note that “protection against the cold” is very relative here. I’m not suggesting that the 3L jacket will be exponentially warmer than the 2.5L UL jacket. We’re talking about a small variance that can make a difference in some, but not all, scenarios. 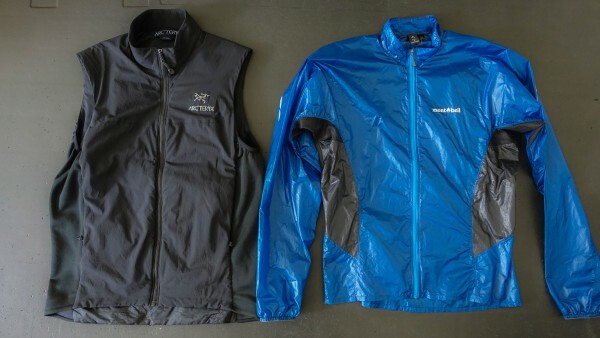 Left: The OR Helium II is a very thin 2.5L rain jacket. It saves weight when you only need minimal rain protection, but it can be a little chilly in cold rain without a 2nd layer underneath. 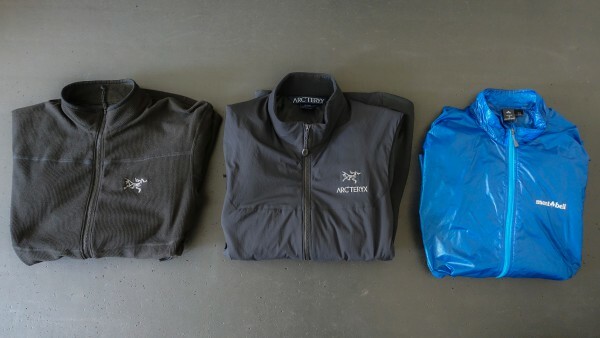 Right: The Arc’Teryx Alpha LT is a 3L GoreTex Pro jacket that offers more protection from the elements, and though it weighs twice as much as the Helium II, it’s still comfortable in cooler conditions without an insulating layer underneath. The drawback: 3.5x the cost. 1) This article mostly discusses insulation for the torso area and doesn’t discuss peripheral body parts like hands, feet, legs, and head. Obviously, the colder it gets the more of these areas you’ll need to cover. Also, addressing these other limbs can have a cumulative impact on the main system; wearing insulated pants in 20-35 degree temps may make your upper body feel warmer with less insulation. A lightweight jacket/pants combo will be more effective than just a heavier jacket. 2) A lot of this is assuming that you spend most of your time hiking. Longer stops and more time in camp may require additional insulation. If you’re careful, this will not necessarily translate into more layers, but you’ll have to plan accordingly. While a thin nylon wind jacket may be sufficient for active use, it will not provide enough warmth for extended idle periods. ¹ – In extreme cold, VBLs (Vapor Barrier Liners), worn under your insulation, can be useful for keeping the insulation dry from sweat. In rare circumstances this means adding a 4th layer.